People often convince themselves that highly successful individuals who possess a special gift set themselves apart from everyone else. However, the reality is that your ability to have success, however you define it, can be accomplished with a few simple steps. Personal responsibility for our actions is seldom championed in society these days, and like it or not, we all live with the consequences of the lifestyle choices that we make every day. We can sit in an office staring at a spreadsheet waiting for our situation to improve or make a few changes that will put us on a path to shaping a better future for ourselves and others. The following are five simple steps you can take to elevate your level of success. It is incredibly easy to fall into the comforts offered by habits and routines, those that make our lives feel like a scene from Groundhog Day, in which the alarm wakes us at the same time every day as we hit the snooze button at least once before jumping into the shower. The familiarity of the daily grind, in which grabbing a coffee as you head into the office before performing the same tasks, can be comforting, yet we often wonder why nothing ever changes. Our education system tends to encourage everyone to learn one correct answer and basically think in the same way. And when it comes to creativity, only a small number of people might be thought of as “creatives,” but this couldn’t be further from the truth. Technology is increasingly replacing laborious and repetitive tasks with automation. Creativity and critical thinking have become essential skills in the 21st century and possess the power to make you stand out from the crowd. There are countless self-help books that advise you how to create new patterns and habits to help you achieve your goals. However, simply getting off the hamster wheel of life and allowing yourself to mix things up by both thinking and doing things differently is a great place to start, and it will stimulate creative thought. They say that we become like the five people we spend the most time with, and ultimately they have the power to either inspire or drain us, so maybe it’s time to re-evaluate the amount of time that you spend with toxic individuals who only bring you down. Surround yourself with like-minded souls on a similar journey or, better yet, those who can see the big picture better than you can. They will help you see failure as an opportunity and will certainly increase your odds of achieving your dreams. Business is 80% people and 20% everything else, and this illustrates the importance of investing your time in getting to know open-minded individuals who enjoy helping turn others’ dreams into reality. What if you surrounded yourself with inspiration? If you begin your day reading the news that reminds you of all the negative aspects of our world, followed by looking at social media sites that show snapshots of lives that are edited to look much better than your own, you will never increase your productivity or creativity. I like to start each day thinking of all the things I’m grateful for. It’s hard to have a bad day when you start your day like this. Try it! Whether they are stuck in a traffic jam or are on a delayed train or airplane, or even doing household chores, highly successful people unleash the power of refueling their creativity during these moments of “dead time” by reading books or listening to podcasts. Books and podcasts on subjects that stretch your thinking are a fantastic way to stay inspired and learn new tools you can use to resolve problems that are stopping you from reaching your goals. Try having fewer calls with people who pull you down and don’t help you move forward, and instead call people who lift you up, or watch a good TED Talk or listen to podcasts or audiobooks that offer advice and insights from others. Removing yourself from a routine or familiar surroundings and going for a walk in a direction where you haven’t gone before instead of staring at a screen will help a lot. Highly successful individuals often find that their brains will naturally join the dots when they expose themselves to new ideas, surroundings and experiences. Bringing focus and clarity to your dreams while working alone in front of a computer in a dimly lit room is good, but is not enough on its own. Do not underestimate the importance of sharing and communicating your vision with others. It will attract the right people to you who will begin to see where you are going and offer ideas to help you get there. By sharing your passion for a future vision and communicating the message with transparency on how it will be achieved, you will find people who can help you to create a solid path to achieve your goals. When Dave Brailsford became the manager of Great Britain’s professional cycling team, no British cyclist had ever won the Tour de France. However, he had a simple concept known as “aggregation of marginal gains” that would revolutionize the sport and lead to his team members becoming tournament champions and Olympic gold medal winners. The philosophy involved improving tiny areas that were traditionally overlooked by 99 percent in the belief that a long list of 1% improvements would be the difference between being champions or losers. Researching for a pillow that offered the best sleep for cyclists to take to hotels, and teaching riders the best way to wash their hands to avoid infection, were just a few of a long list of improvements that, although they looked tiny, ended up making a massive difference. Whether you want to lose weight, build a business or achieve any other goal in life, it’s clear that heading straight for the moon with only one step will almost certainly result in failure or demotivation. Small changes to your daily routine, such as creating a new email signature or changing those boring, stuffy group meetings by asking better questions, could boost your momentum and enthusiasm. All these changes not only deliver long-term improvements but also improve the overall quality of your life. Will what got you to where you are be enough to take you to the next level? There are entire chapters on how to act in the future in my latest book The Anticipatory Organization. I’ll buy the book, you pay the shipping cost. Click here to order your copy. 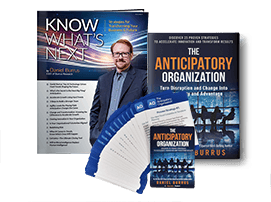 Daniel Burrus is considered one of the World’s Leading Futurists on Global Trends and Disruptive Innovation. The New York Times has referred to him as one of the top three business gurus in the highest demand as a speaker. video-based learning platform for organizations. The New York Times has named Daniel Burrus as one of the top three gurus in the highest demand as a speaker. Daniel has delivered over 3,000 keynote speeches on six continents to corporations, associations, and professional organizations worldwide. Bring Daniel Burrus to your next event, meeting or conference.